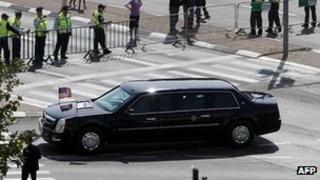 One of Barack Obama's fleet of armoured limousines has broken down in Israel after being filled with the wrong type of fuel, reports say. The car had been waiting for the US president's entourage to arrive when it was filled with diesel instead of petrol, Israel's Channel 2 reported. A replacement limousine had to be flown in from neighbouring Jordan, Maariv newspaper said. Mr Obama is making his first visit to Israel since taking office. He was welcomed at Ben Gurion airport, Tel Aviv, by Israeli Prime Minister Benjamin Netanyahu and President Shimon Peres. It is believed the limousine had left the airport some two hours previously and had broken down on its way to Jerusalem where Mr Obama was due later. The owner of a local tow-truck company, Moti Matmon, told the UK's Daily Telegraph that the US Consulate in Jerusalem had asked him to recover the vehicle. "They told me that this was Obama's car," he told the newspaper. "They didn't say what had happened to it. They just said it had got stuck. Only the mechanic was there when I arrived. The driver had left in another car. The whole thing was very funny." Mr Matmon said the limousine was being repaired at a garage in Jerusalem. Despite the apparent hitch, correspondents said the atmosphere for Mr Obama's red-carpet reception at Ben Gurion airport was friendly and relaxed. President Obama even made a light-hearted reference to Mr Netanyahu's warning of a "red line" with Iran's nuclear programme. As they headed to inspect a nearby anti-missile system, TV cameras picked up Mr Obama asking a military official: "Where do you want to start?" "We are following the red line, sir," the officer said, referring to a red line on the tarmac. "The red line, okay," said Mr Obama, who smiled, gestured with his thumb toward Mr Netanyahu and said: "He's always talking to me about red lines." On Thursday President Obama will visit the West Bank to meet Palestinian President Mahmoud Abbas.